The 5 Best Mini Pontoon Boat in 2019 - Outdoor Gear World! Pontoon boats are the beloved way to enjoy fishing, or just wandering on the calm water in a pond or lake. It’s a refreshing way to enjoy nature on a lakeside alongside your partner. A pontoon performs perfectly when you need to keep floating in calm water for fishing purpose with a stable platform. ​Finding the best mini pontoon boats is easy if you know which type, size and weight capacity you need. For this reason, we have compiled a guide to help you find the best mini pontoon boat for your next vacation tour on a lake. Classic Colorado pontoon boat is a true classic in every sense of it. The pontoon boat has an anchor system with pulley and cleat controls that fits on both the left and right side of the boat. The bladders of the boat are resistant to heat levels. In addition to that, you have one year warranty for all parts of the boat. That’s nice. You will also love the fact that the boat has combo quick fill valves, making it easy to assemble. To add more convenience, there are three oar-lock positions in the boat. It also comes with the strong two-position motor mount. The valve design for its bladder may be a bit stubborn to manipulate. But it can be managed easily Colorado pontoon boat has an adjustable footrest with padded plastic for more convenience. You can mount the rod holder in three different ways. This provides more convenience for your expedition. Cumberland is another portable and durable pontoon boat from Classic Accessories. It is shaped like a hydrodynamic hull to provide superior steering and tracking. This boat comes with an integrated fish ruler, mesh stripping apron, and 2 cargo pockets. You can easily keep your fishing accessories or other valuables in these spaces to help you gain complete focus. Cumberland has other features that are worth mentioning. It has two fishing rod holders, adjustable backrest, and thickly padded seat for better comfort. To make it portable and easy to carry, the boat comes with a backpackable float tube with shoulder straps. This is one of the most portable pontoon boats you can ever find in the market. Interestingly, it provides the perfect place you need for your fishing expedition. The design of this boat makes it resistant to abrasion. It is a top quality mini pontoon boat that can actually stand the test of time. However, some users may not be comfortable of the 350 lbs maximum load capacity. But it is meant to be a portable boat, so there shouldn’t be many complaints about its load capacity. Classic Colorado XT is an impressive pontoon boat with a customized transport wheel for easy movement of the boat. The aluminum oars and powder coated steel frame makes it’s a very durable pontoon boat. You can mold the rod holder in 6 distinct positions, giving your versatility. It also comes with adjustable footrest and seat mount for more comfort in the boat. There are 2 insulated drink holders as well as 20 pockets to keep some of your valuables during your fishing expedition. Colorado X has other laudable features, including boat retention cord, adjustable deluxe seat, multi-position rod holder, 2 removable fly patches, wire rear storage, and weatherproof motor mount. The anchor mechanism comes with a mesh bag and a pulley system that easily routes the anchor sideways. Classic XT may be more expensive than some other models, its overall qualities certainly overshadow its price range. It is a great value for money. Roanoke is another classic series mini pontoon boat for the money. It has similar features with the model above, but this one is more lightweight. Because of its weight, the boat can be maneuvered easily with no troubles. Roanoke also has armrest storage with small mesh pockets and 2 large pockets to keep your valuables. There is an adjustable footrest for people of all foot sizes. You can easily adjust the footrest to stay more comfortable. The fold-down seat is designed with sturdy plastic. This helps prolong the lifespan of the pontoon boat. The O rings at the oars of the boat are not very durable. That is the only negative side of the boat. This boat is quite portable as its loading capacity is 350 lbs. It comes with 1-year product warranty on all parts and accessories. Overall, XT classic rules the world of pontoon boats when you consider its overall features over the others in the market. Sea Eagle is a rugged, lightweight, and portable pontoon boat. It is one of the most portable boats as it has the maximum load capacity of 450lbs. It is only suitable for one person as well. So, if you are looking for a simple and very portable pontoon boat for your fishing expenditure, this inflatable boat will be great for you. But it may not be ideal for 2 or more persons. There is an optional mount for electric motor or HP gap for powering the boat. As an inflatable boat without frames, you can easily inflate it to make good use of it. When you are done, you can deflate and carry it in a bag. It provides a more efficient and effective way of enjoying your fishing expedition. The boat’s floorboard is designed with wood. This gives you a perfect place to cast. The hull of the boat is designed with top quality materials for durability. It is ideal for creeks, bays, rivers, and lakes. Q: Why should I need a mini pontoon boat? A: A mini pontoon boat is portable and easy to carry when you are going on a camping or for vacation. It is always lightweight, easy to store and sturdy enough to keep your floating on the water. Q: How much a mini pontoon weigh? A: It depends on the size, materials, and construction of the pontoon you may buy. The weight of a mini pontoon can range around 45-70 pounds alone without a motor. Q: Which features to consider the most when buying a mini pontoon boat? A: You must know the capacity, weight capacity, the rod attachment, storage bags, construction materials, sturdiness, product weight, and other accessories to make sure the one you buy would be the best and the most suitable according to your needs. Q: Are mini pontoon boats reliable and stable? A: Mini pontoon boats are meant for a single person and these come up with weight specifications as well. 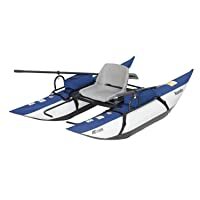 If these are used according to the given specs, these should be reliable and stable and float on water without any problem. Q: How much weight a mini pontoon may carry easily? A: A mini pontoon which is meant to be used by a single person usually comes with a weight capacity of around 350-450 lbs or sometimes 500lbs. you may look for a suitable one if you are a heavy or tall person. Q: Do we get a motor along with every mini pontoon boat? A: No, mini pontoon boats may not offer a motor along with it and you may need to buy or arrange it separately that matches the needs. Some mini pontoon boats may come with suitable motor for easier use. Q: Which type of mini pontoon boats are cheaper yet sturdier? A: Inflatable mini pontoon boats always cost lesser than other types of pontoon boats and they are also easier to carry as compared to the other ones which have heavier structure. Q: How much a mini pontoon boat costs? A: It is hard to say anything about the exact cost but you can find an inflatable mini pontoon or a single person pontoon within the 500-1000usd price range. It depends on the features and the construction materials, accessories and the size of the boat that determines its cost overall. Q: Can we carry a mini pontoon in a car? A: An inflatable mini pontoon can easily be folded and carried in a car after detaching its motor in a careful manner. Q: Which accessories we may need with a mini pontoon? A: You may need to buy the oars, suitable motor, or a pump for inflatable mini pontoon if they are not inflated automatically. Depending on your boating needs, the area where you need to take the pontoon with you, you can surely find an affordable, sturdy and reliable pontoon boat to enjoy your visit to the favorite lake or pond area. To make sure you will stay away from the possible issues, make sure to get the pontoon that keeps you stable on water and balance your weight successfully. You need to be sure that you have the right motor with the needed horsepower to push your mini pontoon on water so that you may not be stuck anywhere in the middle. Accessories, attachments and sturdy construction may help you choose the best mini pontoon so that you will be staying away from all kinds of troubles during your visit for fishing or for just enjoying the calm water flow.